In Capital Gaines, Chip Gaines shared what he has learned in his life and how he isn’t afraid to take risks. Chip Gaines is an entrepreneur along with his wife Joanna. They both founded Magnolia Homes, Magnolia Market, and Magnolia Realty. They both host HGTV’s Fixer Upper. Chip shared how he struggled in school and how in first grade he couldn’t read sentences. He recalled the school dividing up the children into different groups and he was put into the Penguins group. His group would be sent to the gym once a week when it was reading time. Chip always believed in looking at the best in life and he realized that Penguins are very unique birds. They can’t fly but they can swim! He shared some of the success stories of Walt Disney, Albert Einstein, Oprah Winfrey, and Michael Jordan and how they were all unqualified and the world looked down upon them and their personal goals. They were all able to overcome their challenges and they all made a difference in their life. Chip believes everyone has a purpose, and he wants people to go after it with everything you got. Chip also opened up about how he dreamed to be a baseball player and he was one of the few who made it into a college team. He was later cut from the team his sophomore year. He went into a deep depression and he finally found another passion of his and he started three different businesses in his mid-twenties. He also revealed how he had a couple of challenges throughout the book with running these businesses and how a short trip to Mexico changed his life and made him a better entrepreneur. It also taught him the importance of grace and how he related to the prodigal son after the trip. He also opened up about how he met his wife. He also shared how it truly is working with his wife every day and being with her constantly. He admitted that they had to learn the importance of not bringing their work home with them. They give themselves room to be themselves and they have learned how critical it is to work together and fight together for their marriage. I would recommend this life changing book to anyone enjoys watching Chip on Fixer Upper. This is a wonderful autobiography on the life of Chip Gaines. I loved the different principles he shared about what he has learned throughout his life. One of my favorites was the chapter on fear and how the world is teaching us the world is bad and there is hardly any good people left. Chip recognized that most of us live in fear and we let it hold us back from being everything we were created to be. Some of us are afraid to take a chance and pursue someone we like, afraid of going after a job we really want, traveling to another country, and much more. He encouraged readers to take a chance and not to live in fear of the world. Towards the end of the book, he revealed how he tried a “when you will die calculator” based on your health, weight, BMI, and lifestyle choices. He wrote what he wanted his obituary to say about his life and how he wanted to live a life that mattered. I really believe if readers will listen to some of the lessons Chip Gaines has learned and how he chooses to live his life and make every day count, they could also see their own lives improve! 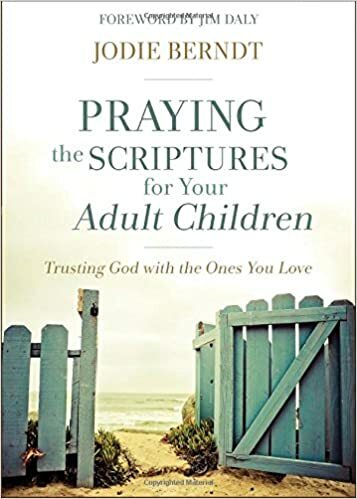 In Praying the Scriptures for Your Adult Children, Jodie Berndt explored the topic of prayer and how we can effectively pray for our adult children. She begins the book by reminding readers of Nehemiah 4:14 and how the Lord is awesome and He will fight for our families and their homes. She believed in the power of releasing blessing over our children’s lives and learning how as parents we have to let our children grow up and to become adults. Each chapter contained personalized prayers for yourself and prayers for your children. She has included scriptures that parents can pray over their adult children. The book contained chapters on praying for their spouse, marriage, through a trouble marriage or divorce, place to live, job, grandchildren, infertility, health crisis, addiction, prodigal, and much more. This book will guide readers into praying for their adult children, their spouses, and their future grandchildren. I would recommend this life changing book to anyone who is ready to commit to praying for their children and families. This book enclosed tons of scriptures and I loved how you could easily place your children’s name into the verse. This book didn’t hold back in exploring topics that could affect our children. I believe every parent will be able to relate to the different stories presented throughout the book. A big part of prayer is trusting that God will protect His children and be with them through whatever, they go through. If you’re looking for an amazing book on prayer, then read this one!